Romance and legend surround the solitary life of a writer. We imagine inspired musing with a companion glass of red; frantic midnight typing in the back room while insight and lamplight spear through a dark, silent house; a connection to deep spiritual truths; beauty and genius and creativity wrapped up in one giant myth. These images can all be true. But in that dim room at 2am, it is easy for fear to settle heavily onto your lap like a purring Russian Blue. As in any creative life or work of passion, each writer endeavours through personal struggles, regularly confronting (or dutifully ignoring) doubt, failure and lack of purpose. The struggle tempts you to convince yourself that it belongs solely to you. The reality, however, brings great hope: many have faced these fears before you; many are facing them right now. 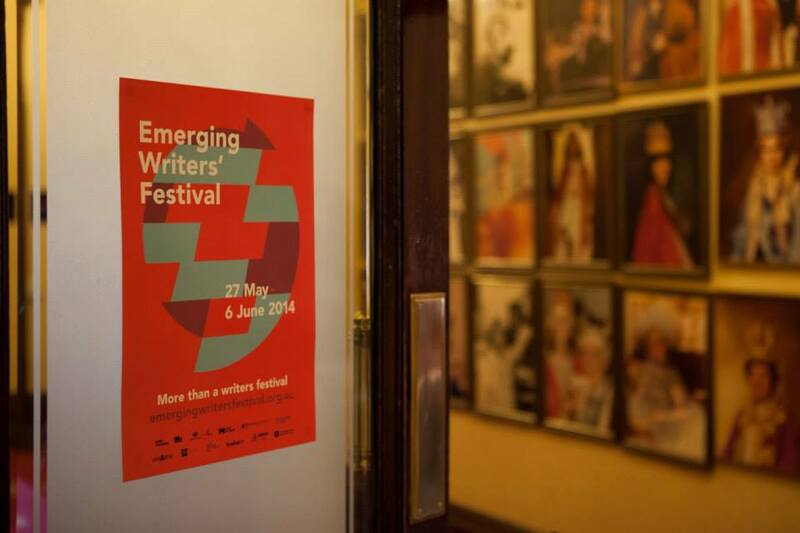 A few weeks ago, I went to the Emerging Writers’ Festival, which was held 27 May – 6 June in Melbourne. As well as an opportunity to hear from the talented, the profane and the stunningly articulate, it was a blessing to meet other writers in similar situations to my own. They, as well as the ones who have ‘made it’, have faced the same battles in the back room at witching hour. Maxine Beneba Clarke, Hannah Kent, Krissy Kneen, Benjamin Law and Felix Noble at The National Writers’ Conference. 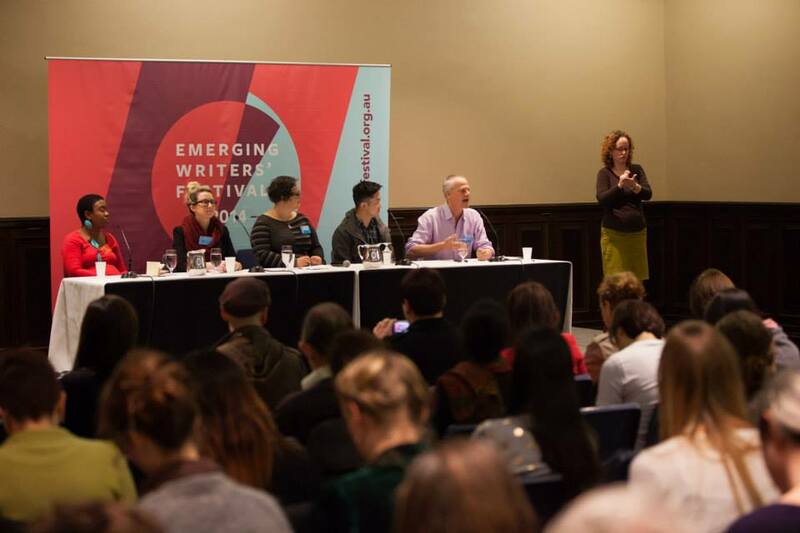 Dion Kagan was one of the panellists at Emerging Q&A (like ABC’s Q&A but with interesting guests and a sassier host). 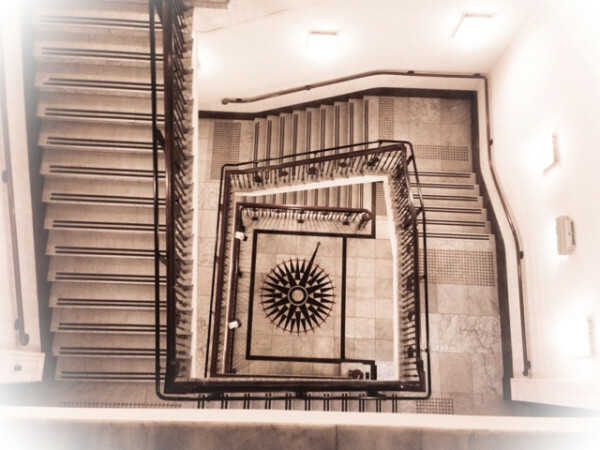 In a moment of honesty, he laughed: ‘As polished and gorgeous as we look up here, we’re all dying on the inside.’ Dion acknowledged the frightening element of putting yourself under scrutiny, a huge element of publishing words. I know what she means. I was invited to perform at Amazing Babes, an event based on Eliza Sarlos’ excellent storybook about the women that have inspired her. On a drizzly Saturday night, eight literary ladies took to a dark, fairy-lit stage in the back room of a Brunswick pub to declare stories of hope, inadequacy, and friendship to the sold-out crowd. Some of us were wary of getting behind a microphone. Brodie Lancaster, founder and editor of zine Filmme Fatales, admitted at the beginning of her speech, ‘My voice isn’t shaking because I’m emotional. I’m nervous.’ In response, the crowd whooped and cheered her; Brodie smiled and read on. And let me tell you, the rest of us (Michelle Law, Kat Muscat, Sam George-Allen, Jo Randerson and others) presented a powerhouse performance that were all vulnerable, funny, and sincere. The rawness poured from the stage and swam in the air. The audience was enthusiastic, propelled by the knowledge that we are all in this together. I’m not sure how to express this without a smattering of sentimentality: EWF brought together a community full of love. We’ve all faced the same insecurities and fears. We are all sisters and brothers of the same family. I met people on the stairwell galloping up to a talk on comedy. I went out to lunch with a friend I met via the #ewf14 hashtag (#friendsirl #yolo). A new mate took me on a behind-the-scenes tour of the SA Vic Library and, as a self-confessed bibliophile, I found it MAGICAL. 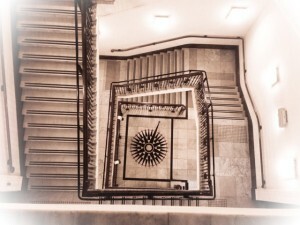 The State Library of Victoria’s pendulum staircase. Thanks for the tour, @writingjordi! A few weeks ago, fellow emerging writer Justin Heazlewood published an article on negativity among Australian creatives, in an excerpt from his new book, Funemployed. ‘If depression is the Black Dog,’ he writes, ‘Then jealousy is the Black Cat.’ It seemed to him that other people’s success was at the expense of his own. But he goes on to write that he realised collaboration and common ground unites, not divides, artists. Oh, it is easy to wish you were given someone else’s particular intersection of hard work, talent, and luck. But relationships within the literary scene are hugely important. In my experience, these relationships are marked by politeness, kindness and the sharing of wisdom. When we have success, many of us share our success with others. It is tempting to slide into the stereotype of lonesome yet noble writer. But at EWF I was welcomed into a positive community that is easily accessible online (‘What’s your Twitter handle?’ was a commonly overheard remark). For we are united by our shared struggles: the doubt, the fear heavy on our laps, and the divine compulsion to write. Great article – I attended the festival too, and as a library technician I got a backstage tour during my training. I adore the backstage at SLV it is a magical place and than you step behind the curtain, and wow. Thanks Tansy! So glad you got to experience EWF too. I’ll find you on Twitter! 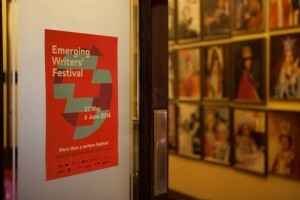 This entry was posted in Arts, Books, Culture and tagged emerging writers' festival, writing. Bookmark the permalink.